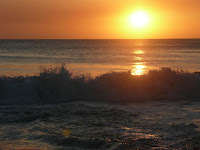 We just got back from a few days on the Pacific coast near the town of Tamarindo. The area is a lot different in look and feel from the Caribbean coast as it's a lot dryer (read "brown") and there are a lot more tourists. Given that, the beaches were beautiful and we enjoyed a wonderful time with the whole family plus one: Meghan's boyfriend, Marius. Marius joined us for spring break and was thilled that he was finally warm!! See the slideshow on the right for more pictures.